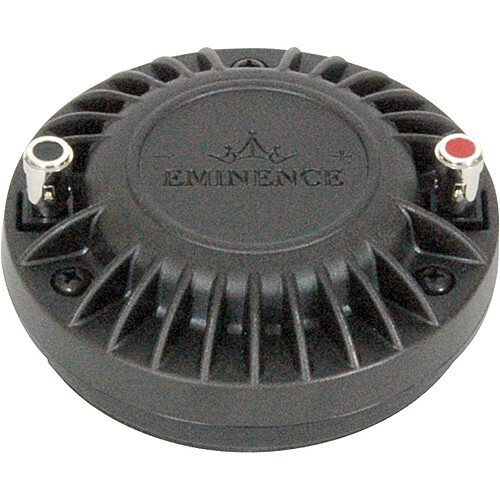 The Eminence NSD:2005 High Frequency Driver (Tweeter) installs onto bolt-on horn flares, features a 1" throat size and delivers up to 50 watts of power at either 8 or 16 ohms. Together the driver and horn install into custom or prefabricated speaker enclosures to deliver powerful high-frequency sound in professional and semi-pro sound reinforcement applications. The 4.16 oz neodymium magnet makes it a lightweight solution for full-range speaker arrays, professional cabinets for club installations, etc. Box Dimensions (LxWxH) 7.0 x 6.0 x 3.0"